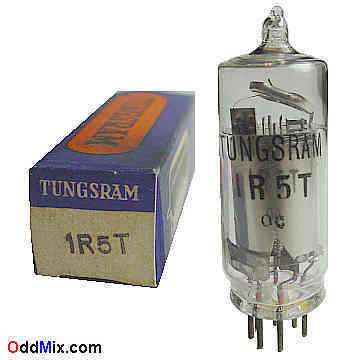 This is an original, discontinued 1R5T electronic tube made in Hungary by Tungsram RT. These miniature type tubes with their 9 micron thick (nine millionth of a meter) filament wire - uses only 25 mA - Half the US Made Tubes! for heater - were the top of the vacuum tube technology. The 1R5T were designed as RF mixer and amplifier for many lightweight, compact, portable, battery operated equipment. Excellent part for antique radio, instrument or other battery operated item restoration. Useful as a replacement, for electrometer circuits or a foundation for a private vacuum tube museum. It is a NOS - [New Old Stock] tube - unused, in original box, in excellent condition. • Heater: 1.4 V, 25 mA - Half the US Made Tubes!